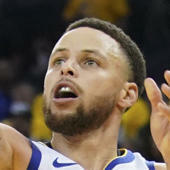 It proved to be too difficult to match the excitement of the Los Angeles Clippers' 31-point comeback over the Golden State Warriors on Monday, but with three games on the schedule on Tuesday night, there was no shortage of action. Starting things off, the Toronto Raptors got back on track with a dominant performance against the Orlando Magic. Starting the game on an 11-0 run, the Raptors used some excellent defense to stymie the Magic all night long and prevent another upset. After scoring zero points in Game 1, Kyle Lowry bounced back with 22 points and seven assists, while Kawhi Leonard led the way with 37 points. The Western Conference's No. 2 seed also came up with a big win to even up the series, but it wasn't quite as easy. The Denver Nuggets trailed by as many as 19 points to the San Antonio Spurs, but they used a furious run in the fourth quarter to stage a huge comeback and even the series. Jamal Murray led the way, scoring 21 of his 24 points in the fourth, as he finally broke out of his slump. Finally, to close the night, the Portland Trail Blazers became the first team in this postseason to take a 2-0 series lead, as they pulled away from the Oklahoma City Thunder in the second half. Damian Lillard and CJ McCollum led the way, combining for 62 points, 12 rebounds and 11 assists. The Trail Blazers squeaked past the Thunder in Game 1, but had no such troubles on Tuesday night thanks to Damian Lillard and CJ McCollum. The dynamic backcourt took over in the second half as the Trail Blazers pulled away to take a 2-0 series lead to OKC. Lillard and McCollum combined for 62 points, 12 rebounds and 11 assists in the victory. Damian Lillard proved that "Dame Time" is not reserved for the fourth quarter. With the clock winding down in the third, Lillard stepped back for a back-breaking 3-pointer after breaking down Raymond Felton. CJ McCollum showed why he's one of the best offensive players in the league with a nasty move against the Thunder. After breaking out some slick dribbling skills, he flipped up a high-arcing floater off the glass. Jamal Murray had a rough go of it in Game 1, and for much of Game 2 as well. But in the fourth quarter on Tuesday night he found his shot, and poured in a bunch of them to bury the Spurs. Murray scored 21 of his 24 points in the fourth, nearly outscoring the Spurs by himself in the frame. Derrick White threw down the early contender for dunk of the postseason in Game 1, and had more in his bag for Game 2. This slam wasn't quite as electric, but it was still pretty nice. The Spurs continued to play well against the Nuggets in the first half of Game 2, and did so on both ends, as this play showcased. First Jakob Poeltl came over for the block, then DeMar DeRozan went down and scored after a nifty Euro-step. After losing Game 1, the Raptors couldn't afford to drop another home game in their first round series with the Magic. And Kawhi Leonard made sure it didn't happen. The Raptors' star man went off on Tuesday night, dropping 37 points on 15-of-22 shooting, while also adding four rebounds and four assists. The Magic as a team struggled on the offensive end in Game 2, but not Terrence Ross. The swingman went for 15 points in the first half, including this huge slam. Coming off a surprising loss in Game 1, the Raptors made sure to get off to a good start on Tuesday night. With Kawhi Leonard leading the way, they jumped out to an 11-0 lead to take control of the game.